Sometimes as a parent you are looking for a quick, fun read for your kids to satisfy their craving for book time. I love to read to my kids, but I just don't have a lot of time to devote to it daily. That's why I can appreciate books like The Thingamabob. It's a cute story about an elephant that finds and umbrella and tries to figure out what it is and what it does. It's short, sweet and well illustrated. Plus, it's a great learning book for beginning readers, with easy words and comprehension. I read it to my 2 and 4 year old. The 4 year old told me it was over too fast and the 2 year old managed to sit still for the whole thing, so that was a bonus. I'd say to be read to, it's best for ages birth- three and for reading themselves it's best for 5-7. 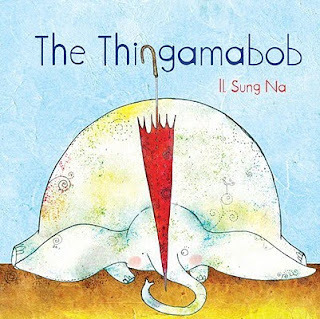 The Thingamabob by Il Sung Na hits the shelves March 9!! !